One of the themes for the Spring 2013 of Stitch is Simple Skirts. I worked in the corporate world of design for over 20 years designing women's clothing for Eddie Bauer, Union Bay and Nordstrom. I had forgotten how much I love designing clothes!! 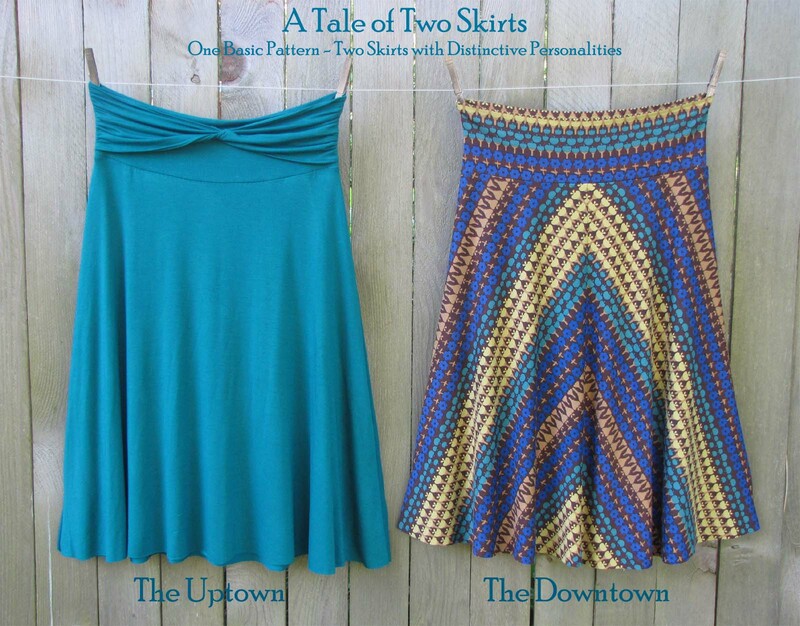 The downtown skirt is a fun and easy project. It is made from knit fabric and has a flattering fold over waistband and four panels. If you haven't made clothing before, I highly recommend starting with an easy project like this. It would be great in a solid or print and I think it is super flattering in the bias cut stripe!!! The uptown skirt uses the basic pattern but incorporates a fun knot and gathered detail at the waist. I will be wearing my "Uptown" with a tank top and sandals this summer. I've already worn the "Downtown" with tights and boots!!! Every day you share a project more fab than the last. Starting to think I need this magazine! YAY!! I have a bunch of knit just waiting to be used! Gotta go find that magazine now! I haven't worn a skirt in forever ~ but if I did/would I'd make that blue one ~ love it! Learn to paper piece with me!